The native of Buffalo, Wyoming, didn’t even plan on becoming an artist until well into college, and now she is an integral member of the Bloomington-Normal arts scene. 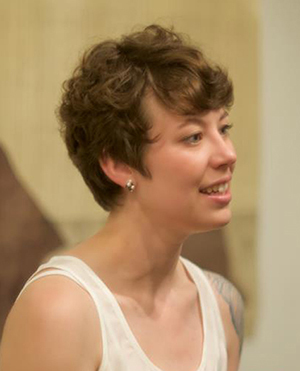 She is a working printmaker, whose art has appeared in the Indi Go Artist Co-op in Champaign and the Swell Gallery in West Dundee and will be part of a two-artist show at the McLean County Arts Center in 2014. 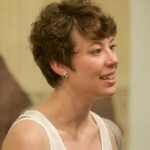 She is the owner of Main Gallery 404, which shows 45 local artists at its downtown Bloomington location. And she runs a community print shop at cometogetherspace, where she offers printmaking classes and facilities. 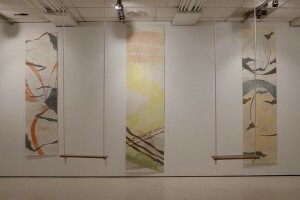 In 2012, while studying printmaking at Illinois State University, Lofgren received a Friends of the Arts grant in support of her M.F.A. show. In May she spoke about her work and the importance of the grants. I initially started my undergraduate degree without the intention of becoming an artist. Then I fell in love with the art department at the University of Wyoming in Laramie, Wyoming. The professors were engaging. I realized all I wanted to do was make art, and I was within a community of people that I, still to this day, love and cherish. So, I found myself when I was about 20 years old realizing this was feasible, that I could actually be an artist. I could give back to the community, I could make a living, and I could continue educating people the same way my mentors did for me. Why did you come to ISU? I came for a number of reasons. One was to have a change of scenery. One was because of the great program that they have including Normal Editions Workshop, a master printing studio that I think is fantastic and really unique to the area. They support their grad students financially and that made all the difference to me as well. I received the grant to help support my thesis exhibition in buying copper and paper. That expense grew exponentially because I started doing large-scale prints. I realized I wasn’t going to be able to do all the expensive framing, and doing all the little things—cards, signs, etc.—on the budget that I allotted. Really, it set me up for a semester of great work. 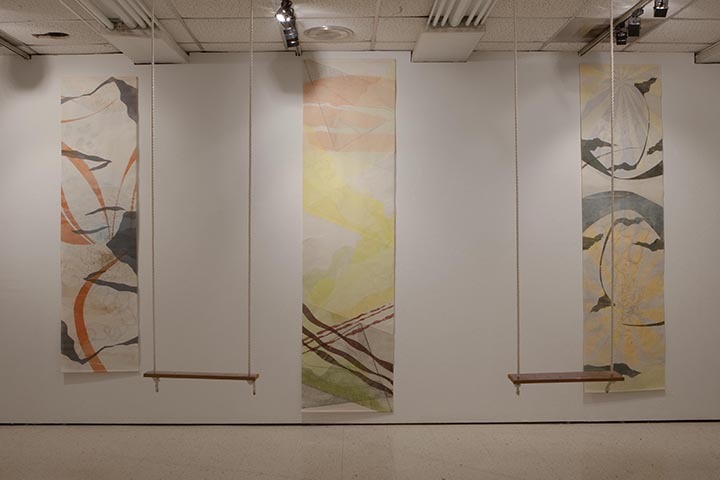 Installation shot of Lisa Lofgren’s Swing Series (relief, intaglio, graphite) with copper plate and cherrywood swings. Describe the work a little bit. For my thesis exhibition as well as my current practice, I do a lot of etching and woodcuts. Intaglio/etching being letting acid eat into copper plates to make lines and pits that I fill with ink and force paper into these inked lines through a press. A woodcut is a reverse of intaglio in that I’m printing the surface of the wood blocks to ink and then transfer to the paper rather than printing the grooves. My imagery is based off the idea of place and surroundings and this grounding point, or, to what I refer to in my exhibition, as the still point. A lot of the landscape imagery that I abstract into different forms have maplike references but are much more about defining a point of access, of symmetry, of rotation, of this specific point that I would hope that you land on more intentionally while viewing the artwork. Why do you think Friends of the Arts grants are important to students? To have any kind of support makes a huge difference in what people can get access to in materials and what people can get access to even in educational facilities, for example, going outside ISU to gain even more specialized education. Beyond that, just something as simple as having an interview and this continued kind of touching base with the alumni, the past Friends of the Arts recipients, you become part of a network. That is really appreciated for someone like me who is trying to get myself out there and figure out what it means to be an emerging artist.